AAA Home Services has been installing water heaters in St. Louis and St. Charles for decades. Whether you are looking to replace your old water heater, upgrade to a larger one, or switch to a new tankless water heater, AAA is ready to help. AAA Home Services will provide you with upfront pricing on our work before we begin the job, and your satisfaction is 100% guaranteed! Call us at 314-968-3050 or 636-928-4933 and we can fix your water heater problem with same day/next day service in most instances! Spire is currently offering $200 – $300 rebates on Natural Gas Water Heaters, call us for details or view the rebates on their website. AAA Home Services carries the most energy efficient and reliable water heaters on the market, which is not only good for the planet but ultimately saves you money. We offer conventional storage tank hot water heaters and we carry both electric or gas units depending on the demands of your home. We can provide you Factory Authorized Sales and Service on hot water heater brands such as A.O. Smith, State, American, Bradford White & Lochinvar. When installing a new water heater with AAA, it will include a minimum of 6 year factory tank and parts warranty. GAS WATER HEATERS Regardless of whether your home uses natural gas or propane, we have models available with capacities ranging from the most modest needs, to even the most substantial needs. ELECTRIC WATER HEATERS For those seeking the convenience of an electric water heater, we offer a large selection of models and features to meet the needs of every homeowner. We also install tankless (instantaneous, on demand) water heaters. For tankless water heaters, we offer Factory Authorized Sales & Service on Rinnai and Noritz. The primary advantages of tankless water heaters include the abundance of a continuous flow of hot water and a potential energy savings. AAA will help you determine if this is the best solution for your home based on your needs and the overall cost of the system. From hot water heaters to tankless water heaters to any replacement part you can think of, AAA Home Services has what you need to ensure your water heater is running smoothly. Check out the rebates offered by the utility companies and add the AAA discounts as well for the overall best value for you. Whether you need your water heater repaired or replaced with a new installation, our team is ready and able to meet your needs. All the technicians at AAA Home Services are qualified to provide up-to-code repairs and replacements for your water heater. We are highly trained in factory recommended maintenance and service requirements on all brands. Proper water heater maintenance can help prevent leaks and improve efficiency, we inspect for sediment deposits and flush if necessary and perform flue safety checks, which could save you money over the long run. Our specialists are qualified to replace or service any make or model in your home, so you can be sure your water heater will be set up correctly. For premium water heater service, sales and installation in St. Louis and St. Charles, call AAA Today! Call AAA, We’re On Our Way! What type of maintenance does my hot water heater need? Manufacturers of water heaters recommend annual maintenance from a professional plumber — from periodic checks on the anode rod, to ensuring that all connections are secure. My hot water heater doesn’t provide as much hot water as it used to, why? Over time, hot water heaters build up sediment. It’s this sediment and lime that will become a barrier between the burner and the water itself, making it harder for the water to heat. The more sediment, the more fuel it requires to heat the water and the less hot water it can provide in an efficient manner. What is the average life of a water heater? Home hot water heater life expectancy is 9-12 years, with type of unit and water quality being factors. How long does it take to heat up a 50 gallon hot water heater tank and how long does that last? It generally takes 1 1/2 to 2 hours to heat up a 50 gallon tank. 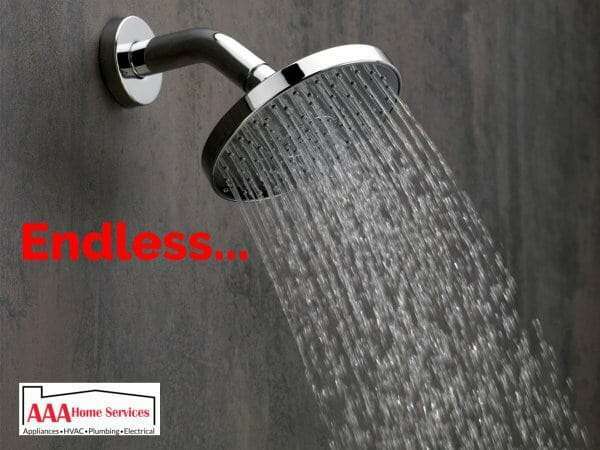 The average shower uses 2 gallons of water a minute and that equals approximately 17 minutes of hot shower for a 50 gallon tank before it runs out of hot water. Are tankless water heaters, also known as “on demand” water heaters, a good alternative? Tankless water heaters cost a more than conventional heaters but may save you in energy costs. The size of the unit needed will affect the price, as some units only adequately supply one or two fixtures operating simultaneously so some homes might require a large unit or more than one tankless water heater. AAA will help you determine if a tankless water heater is right for you home.